Published: Nov. 18, 2018 at 04:51 p.m. Published: Oct. 28, 2018 at 07:38 p.m.
Arizona Cardinals quarterback Josh Rosen finds wide receiver Christian Kirk for a 9-yard touchdown. Published: Oct. 7, 2018 at 08:35 p.m.
Arizona Cardinals quarterback Josh Rosen throws deep to wide receiver Christian Kirk for a 75-yard touchdown. 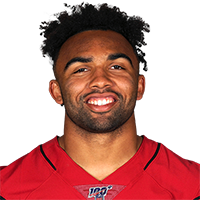 Published: Sept. 9, 2018 at 07:20 p.m.
Arizona Cardinals wide receiver Christian Kirk goes 44 yards on the punt return and nearly takes it the distance against the Washington Redskins in Week 1 of the 2018 NFL season.